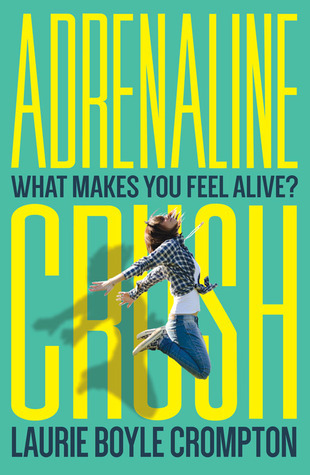 Adrenaline Crush is a quick read that's somewhat of a coming of age story. Dyna is a huge daredevil -- her whole family thrives in living on the edge, and she's no different. An accident early in the book changes her life, though, and suddenly she's settling into a completely different lifestyle. She has a steady boyfriend for once, one who isn't nearly the thrillseeker that Dyna is. And even as she heals physically, she's still struggling mentally with fear and anxiety. The book follows her through her recovery as she tries to rebuild her life. Dyna is a bit abrasive at first -- she is very in your face and unapologetic about the way she is. She's outspoken, confident in herself, knows what she wants, So for the first few chapters, Dyna might make you uncomfortable, if you're not used to a teenage girl who owns up to her desires and speaks frankly about whatever comes to mind. After her accident, she softens a bit as she grows more perspective and maturity. That's not to say that she suddenly starts making stellar decisions or anything, though. The therapy sessions were ... interesting? As someone with a background in psych, I found the group sessions to be lacking, and a bit unrealistic. There's some evidence that exposure therapy has had success for soldiers with PTSD, for example, but it's not universal. And to the best of my knowledge, exposure therapy is done in increments -- check out any article about helping people with a fear of flying. You visualize getting on a plane, maybe you visit an airport, you sit in an airplane that isn't going anywhere... you work your way up to experiencing the thing that you are afraid of. I doubt a good therapist would just take a group of untrained, inexperienced people out hiking in a thunderstorm and hope for the best, Then again, your average teenaged reader probably isn't going to be thinking about that, so that's a complaint for me and readers who are exactly like me, and that's about it. I liked the group of people that Dyna met at therapy and would have liked to get to know them better. They're pretty fleshed out during the relatively small page time they get, but I would have liked to see more of them. Since this is a pretty short book, most of the page time is devoted to Dyna's recovery, her changing relationship with her parents -- while I had some qualms about them, it was cool to see actual character growth in the adult characters, not just the teens -- and to her boy problems. I admit that I skipped ahead in this one to see who Dyna was going to end up with. Both the guys have their pluses and minuses, but it's pretty clearly telegraphed for a while what the actual ending is going to be. I had some feelings about it while I was reading, but now, a while after finishing it, I think I'm okay with how things ended up. Check this one out if you're looking for a quick, fun read. There's a little bit of fluff, but also some serious issues get tackled, too, so there is definitely more than meets the eye to this one.